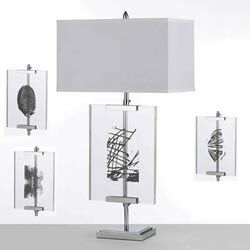 Catherine Smoak's Easel lamp comes with 4 interchangeable screened prints. This flexibility allows you to update the lamp depending on the mood of your decor. The lamp is finished in chrome and acrylic resting underneath a white poly silk hard-back shade. Due to handcrafting no two are alike.